October saw our second Rumfest of the year and our fourth attendance at the London event. We had tickets for Saturday only, but over the years we’ve learnt to take a more selective approach and make the best of our time, having learnt our lesson of drinking everything in a few hours in the early years of Rumfest. As an aside, since the May Rhum Fest in Paris, I’m now always disappointed there’s no spittoons at UK drinks events – take a sip or to of the sample and then discard the rest. In this country it seems like it’s almost unacceptable to bin alcohol, whereas it’s the norm in France. Our ‘pacing’ was also helped by the surprise bonus of Sunday tickets gifted to us by full-time rummers, the Floating Rum Shack. As we didn’t have early entry with our standard tickets, we managed to sign up for some of the sold-out masterclasses through our rum contacts, mainly those met at the Rum University the day before. 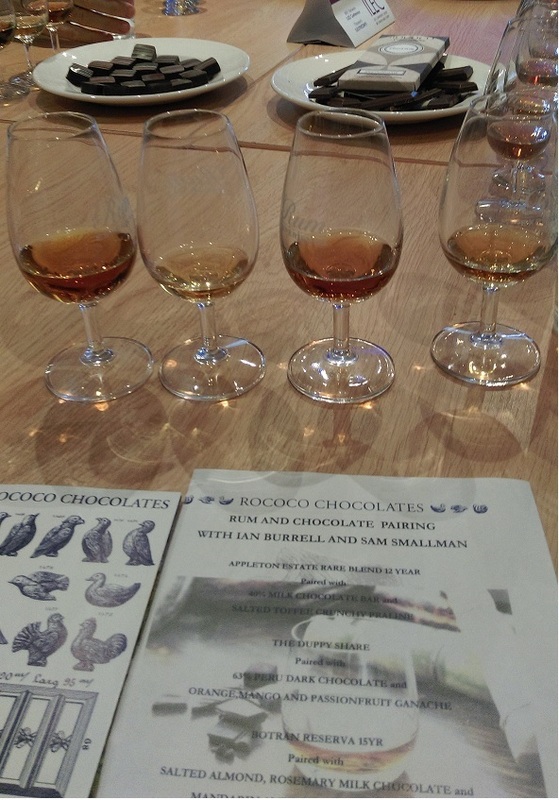 Throughout the weekend we attended rhum agricole, a Rococo chocolates pairing and a Rumblender session. Rhum agricole: this was different format from other masterclasses we’ve attended at Rumfest. Abandoning the previous format of sitting down and having a tutored tasting and background of each brand, all the representatives from the Martinique rum brands had their own little table to present their range of rums rarely seen in the UK. Being French, this was one place there was spittoons, which were definitely needed given the number of rums to try in 45 minutes! Being agricole (distilled from sugar cane juice rather than molasses), some very powerful on the tastebuds. Standouts for me were Trois Rivieres Cuvée de l’Océan, which has a really unique taste due to the saltiness of sugar cane grown near sea – definitely one I’d like to taste again; a spiced rum from La Mauny (where as a francophile I also learnt the French word for ‘clove’ - which translates as a screw or a nail) and the aged St James products. Rococo chocolates – there’s usually a fee for this class but it was free this year. On entry, we had four rums lined up in front of each place setting and a list of the pairings – we got two chocolates per rum. Rococo were keen not to go for the ‘obvious’ pairing such as a caramel with a sweeter rum like Appleton and show how chocolates and rum can really complement each other. I certainly wouldn’t disagree. Rococo chocolates are quite expensive, but are high quality. My favourite was a salted almond and rosemary milk chocolate. I’d say it worked for Rococo too as I’ll definitely be stocking up on some treats from them. Rumblender: run by Floating Rum Shack to showcase the service offered by Rumblender.nl, which is as it sounds, combining base rums – which come from the world’s leading distilleries – to perfect your own blend. We got to get scientific with pipettes and measuring cylinders to (hopefully) end with a desirable result. I called mine a Bang of the Rum (cheesy wordplay time), which was a mix of sweet dark rums, a smokey rum and a dash of a firey white. I was happy with the result, although it had a shorter finish than I’d usually go for. PS – a non-rum highlight from Rumfest was the Trinidadian mutton roti. I feel a visit to my local Trini cafe coming up soon!